Walmart has La Crosse Technology Color Alarm Clock with Temperature and USB Port for $12.70. Shipping to store is free, otherwise shipping to home is free on orders over $35. This La Crosse Technology Color Alarm Clock combines style and functionality. It features a bright LCD display with large digits and is suitable for your bedside table or dresser. This La Crosse alarm clock displays the indoor temperature with the settings reading in Fahrenheit or Celsius, as well as indoor humidity. It shows the moon phase along with the current date and includes an AC adapter. It features a USB charging port for your mobile device, such as a tablet or smartphone. Adjustable brightness settings to your liking and has an adjustable snooze from 5 to 120 minute duration. These Candles are originally $21 each! Walmart has SKIL 014-556-SKL Accu Level, 24" for $4.99. Choose ship to store to save on shipping or free shipping on orders $35 or more. 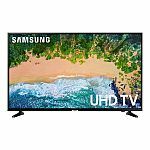 Walmart has select SAMSUNG TV 4K UHD Smart LED TV on sale. Shipping is free. 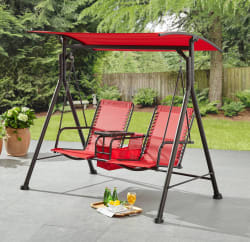 Walmart offers the Mainstays Big and Tall 2-Person Bungee Canopy Porch Swing in Red or Camo for $139.95. Choose in-store pickup to drop the price to $135.89. That's the lowest price we could find by $44. It features a powder-coated steel frame. Note: It's also available in Beige for $139.95 with free shipping. 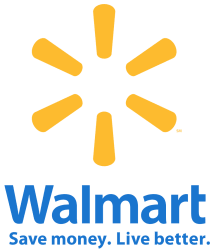 Walmart has the Linksys Velop Triband AC4800 Intelligent Mesh WiFi System 3 pack for $252.75. Shipping is free.